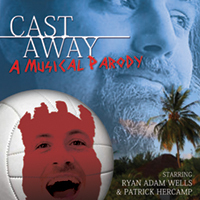 From 2/3 of the award-winning comedy group Sound & Fury and a Kansas City Best of Fringe composer comes: Cast Away: the Musical. Chuck is just trying to survive - the same as anybody. Just like that singing volleyball and the zombie pilot playing the piano. I’m a sucker for sing-song adaptations of things that I love, Tom Hank’s Castaway being one of them. Musicals are one of my favourite things, (queue the soundtrack from Sound of Music), and although I know that this particular film was heartbreaking and powerful, I have seen previous work from Ryan Adam Wells and Patrick Hercamp and have heard tale of the musical talent of Brad Toress, so I knew I could not miss this production. Perhaps unsurprisingly (based on the cast), I realized very quickly that it was also a comedy and a parody of the original film. The script and song lyrics delightfully and cleverly paid homage to Tom Hank’s enormous body of work. The props were comically simple yet effective, there is no such thing as a fourth wall for these guys, and they have a knack for hilarious creativity as they guide the audience through the action of the play. Wells wowed the audience with his powerful singing, Hercamp made a slightly unsettling yet endearing Wilson, and the score and soundtrack written entirely by Torres was beautiful. I highly recommend this show for the simple reason that I find performances like these complex and engaging. You’ll find yourself laughing, crying, reminiscing and surprised. I don’t think I speak only for myself when I say we all feel the loss of watching Wilson float away. But sometimes even stories of loss are full of fond memories, good times and personal growth. Go check it out, and if you’re lucky, scoop up a tiny Wilson of your own on the way out.